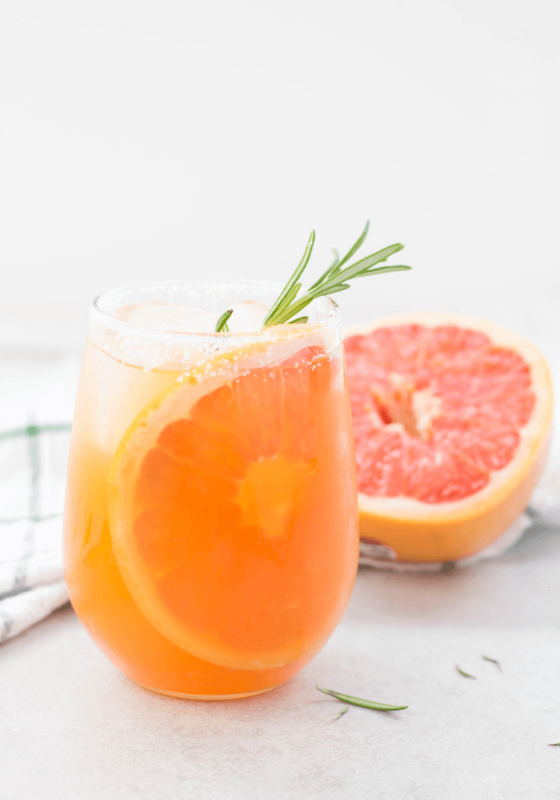 A Salty Dog is a cocktail made with grapefruit juice and gin or vodka with a salt rim. 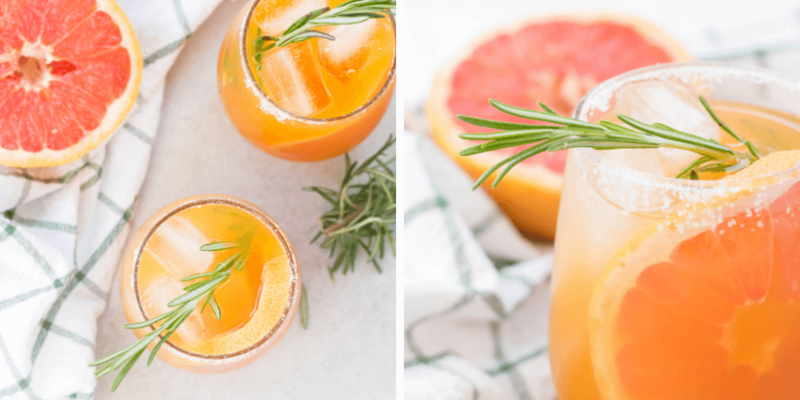 Garnish with a slice of fresh grapefruit and sprig of rosemary to make a beautiful and delicious drink. I feel like grapefruit is one of those foods that is more of an acquired taste. I don’t mind half a grapefruit every once in awhile in the morning with a sprinkle of sugar for breakfast. This cocktail is the same for me- it isn’t what I always crave but it is nice every once in awhile to switch things up! 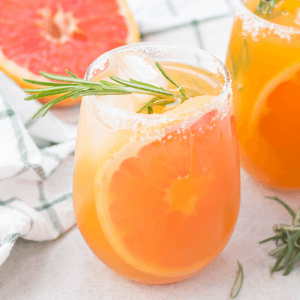 Plus, you can make it really pretty by adding some fresh slices of grapefruit and a sprig of rosemary for a pop of color. 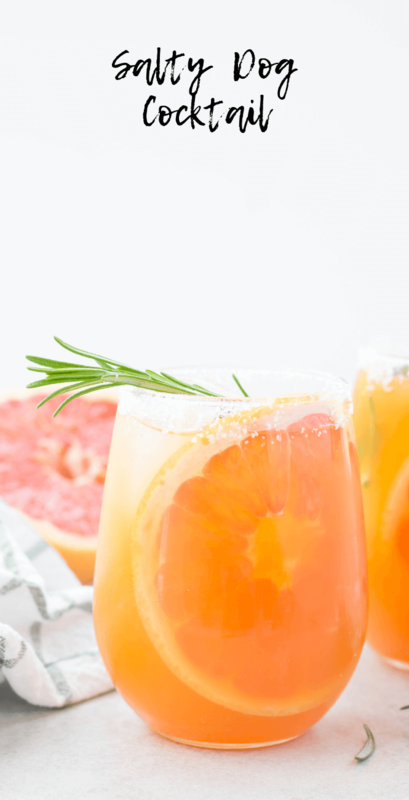 A Salty Dog is just a greyhound (grapefruit juice and gin) with a salt rim added. Traditionally, this cocktail is made with gin but vodka can be substituted which is the way I like to make mine. 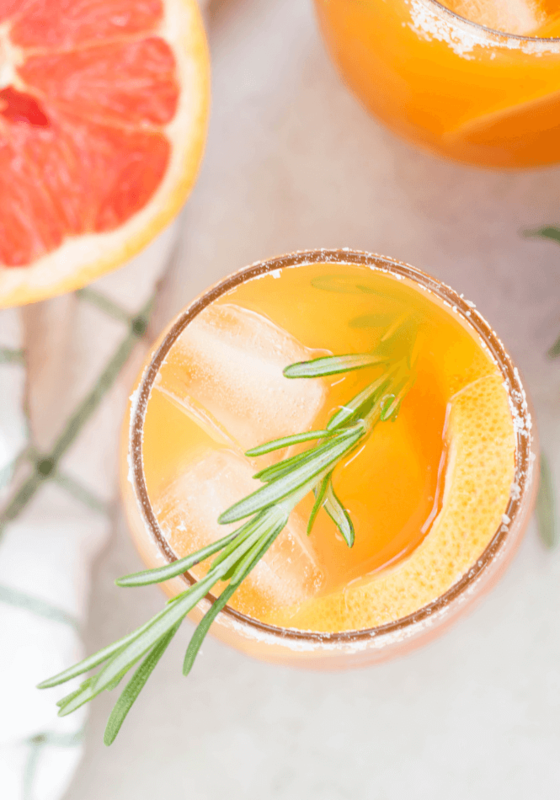 You can choose to add the extra garnish of rosemary and fresh grapefruit to pretty up the cocktail and add just a touch more flavor or keep it simple without. Dip the tip of your glass in water and then coarse salt to salt the rim. Traditionally a highball glass would be used. Add a shot of gin or vodka. 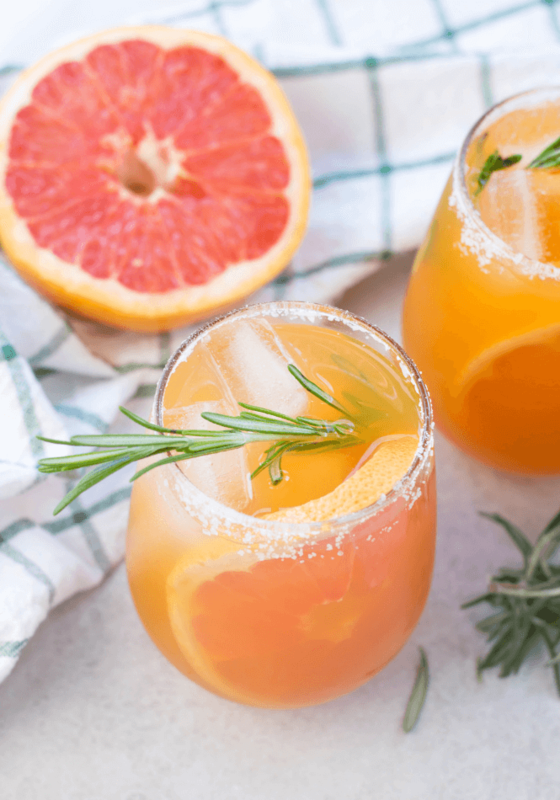 Place a slice of fresh grapefruit inside glass (optional). Garnish with a sprig of rosemary (optional). 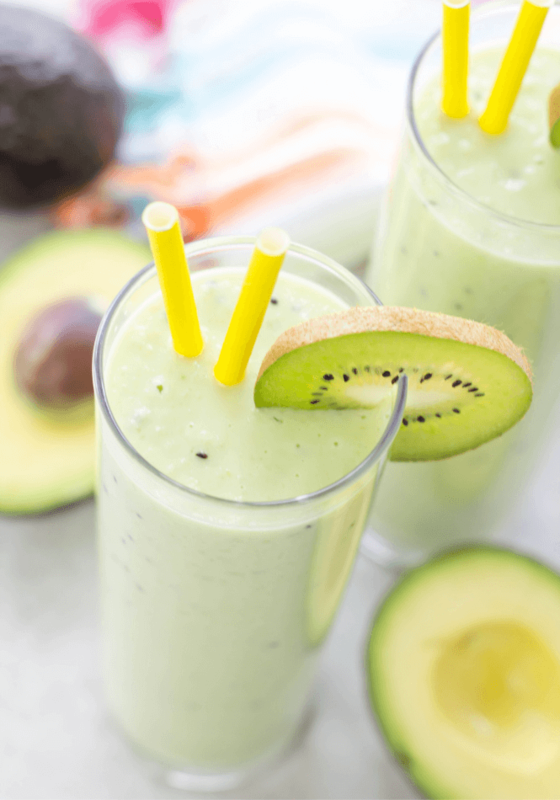 Avocado Kiwi Smoothie is made with fresh avocado, cucumber, kiwis and plain yogurt for a healthy breakfast or lunch that isn’t too sweet. 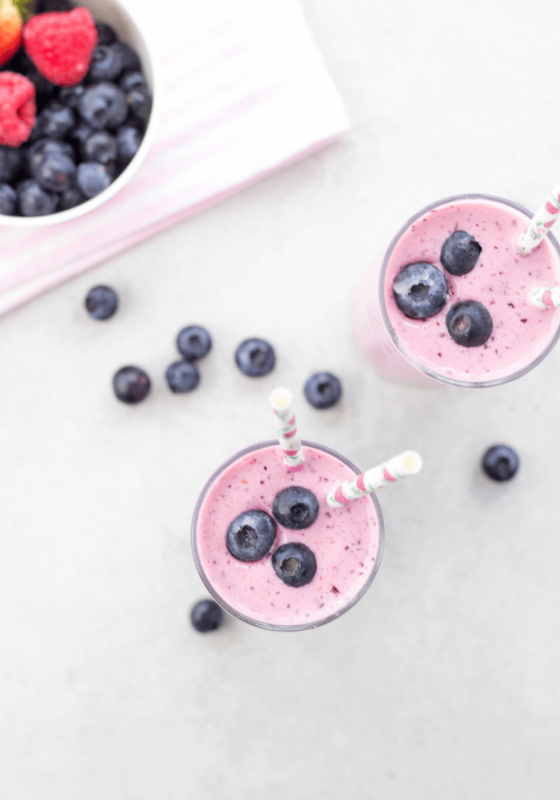 Typically, I am all about those super fruity and sweet smoothies like the Triple Berry Smoothie, but sometimes I just want something nutrient dense and makes me feel good and full for a long time. 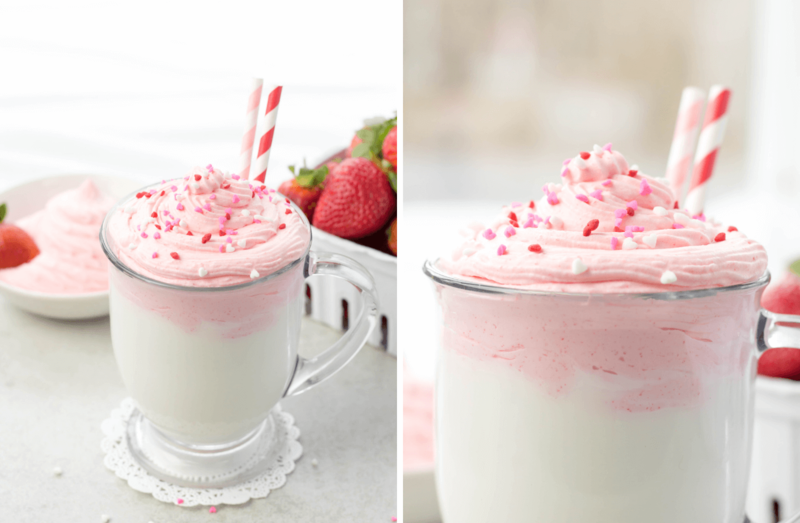 I love this smoothie because it does those things. Here is a breakdown on what the ingredients are doing for our body! Low in sugar, high in fiber with 20 vitamins and minerals. Avocado may be high in calories and fat but it is monounsaturated fatty acids that are healthy and your body needs! Kiwis are always tasty and healthy with loads of Vitamin C. Your immune system will thank you. Cucumber has a mild taste and is super refreshing known to help with hydration. 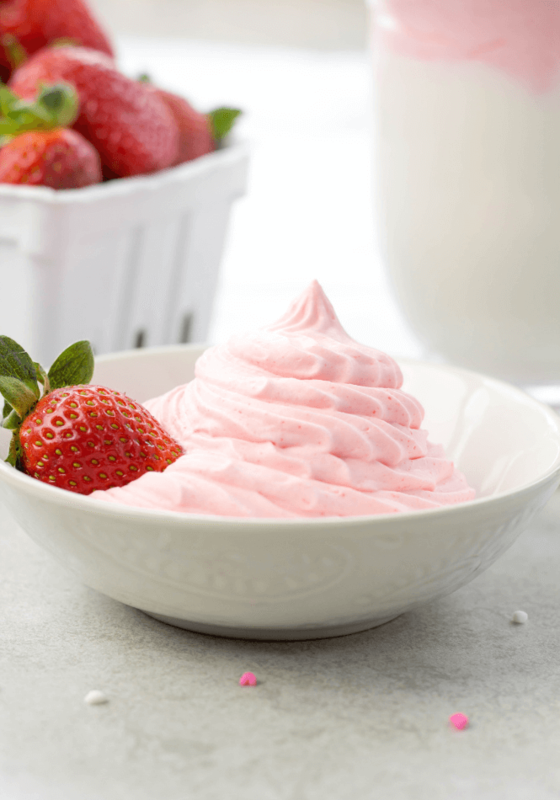 The benefits of yogurt can differ from brand to brand. Look for a high calcium yogurt that is fortified with Vitamin D for bone health. Yogurt also has probiotics to help with your gut health. 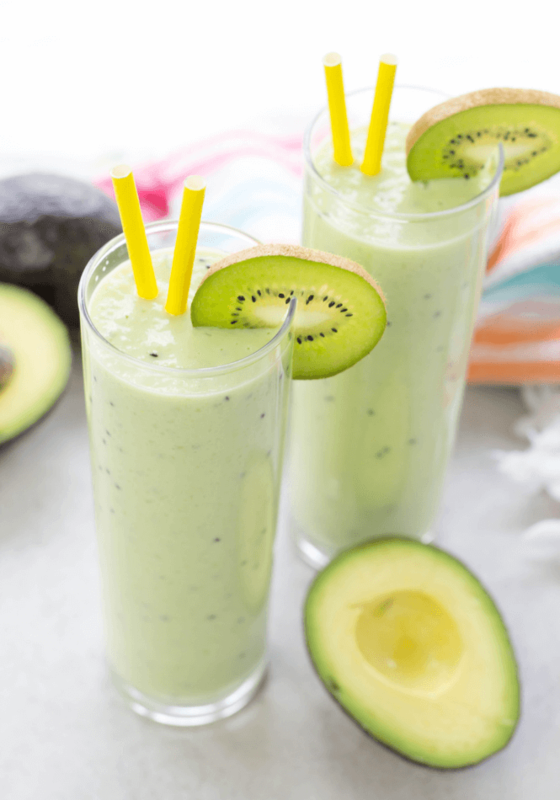 Avocado Kiwi Smoothie is smooth and creamy with a strong avocado flavor and just a hint of tangy kiwi. 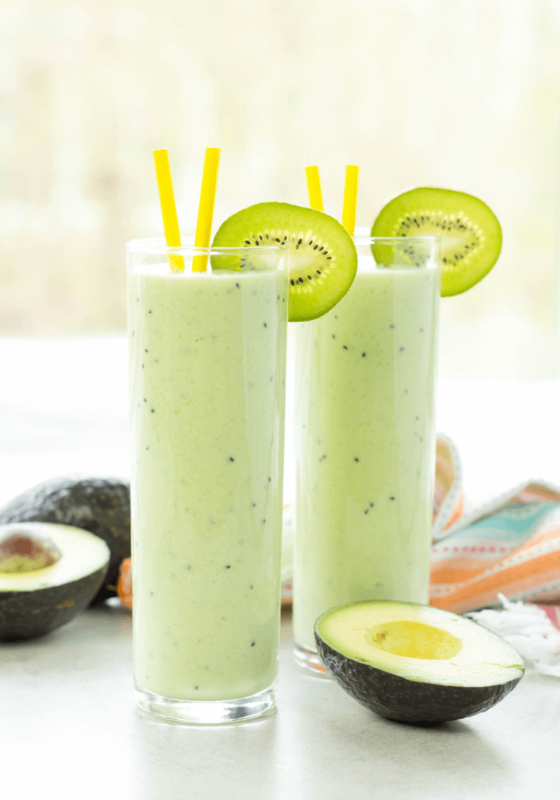 The cucumber and yogurt is added for health benefits and to also thicken the smoothie into a really nice consistency. A great smoothie to start your day with! 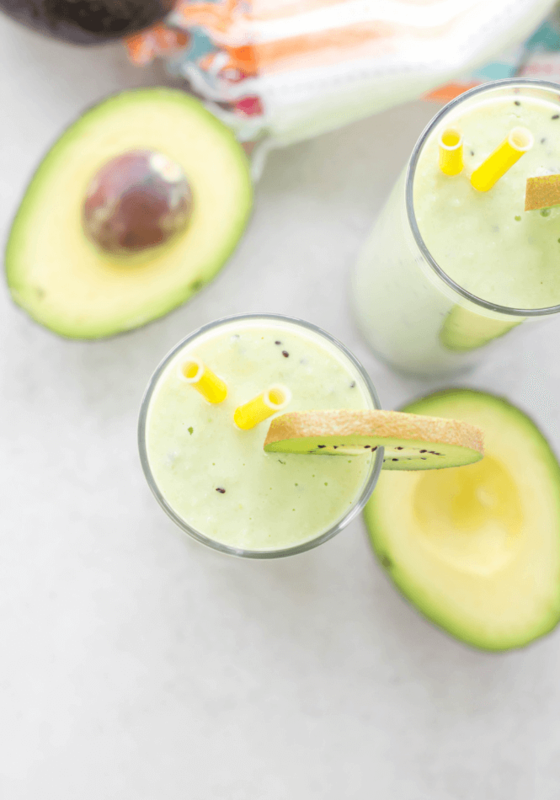 Avocado Kiwi Smoothie is made with fresh avocado, cucumber, kiwis and plain yogurt for a healthy breakfast or lunch that isn't too sweet. Wash and peel all the fruit. Rough chop them and add to blender. Add plain yogurt and ice. You can add honey if you want a sweetener. 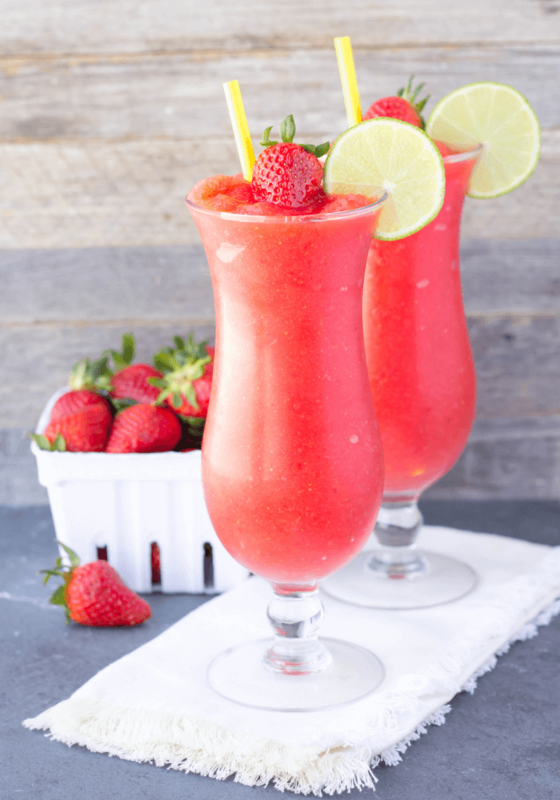 Strawberry Vodka Slush is a frozen cocktail made with strawberries, freshly squeezed lemon juice, vodka, sugar and seltzer water. 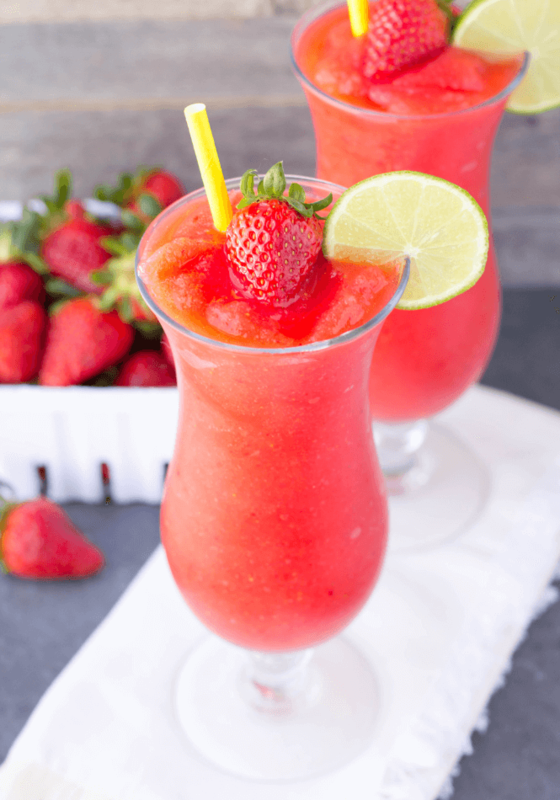 Strawberry Vodka Slush is sweet, refreshing and hits the spot on a warm day. If you are a daiquiri fan, this is the type of cocktail for you and a real treat! There may be snow on the ground here in Cincinnati at the moment but I can’t help to think about sipping this baby by the pool this summer while soaking up some sunshine. Don’t blend for too long! 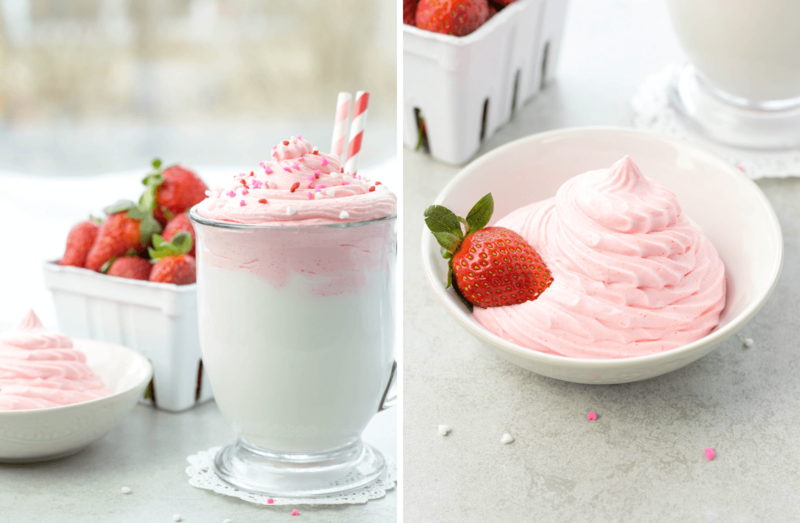 You want a powerful blender and use crushed ice. 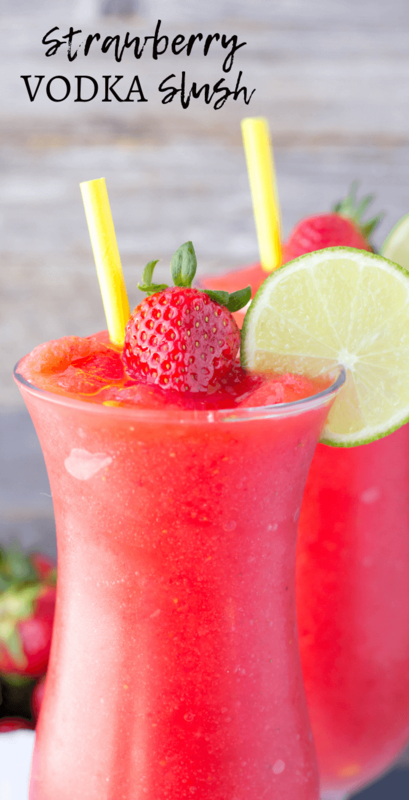 If you don’t have crushed ice, just blend the ice for 30 seconds before adding any other ingredients. This way, the cocktail will be nice and slushie without random chunks of ice. Wash, hull and freeze strawberries. 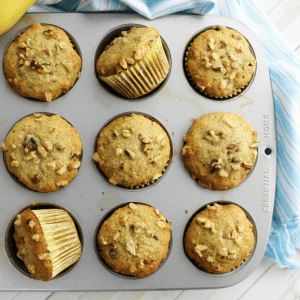 I always freeze the fruits my kids don't eat throughout the week and use for these type of recipes. Squeeze 1 cup worth of lemon juice from about 4 lemons. 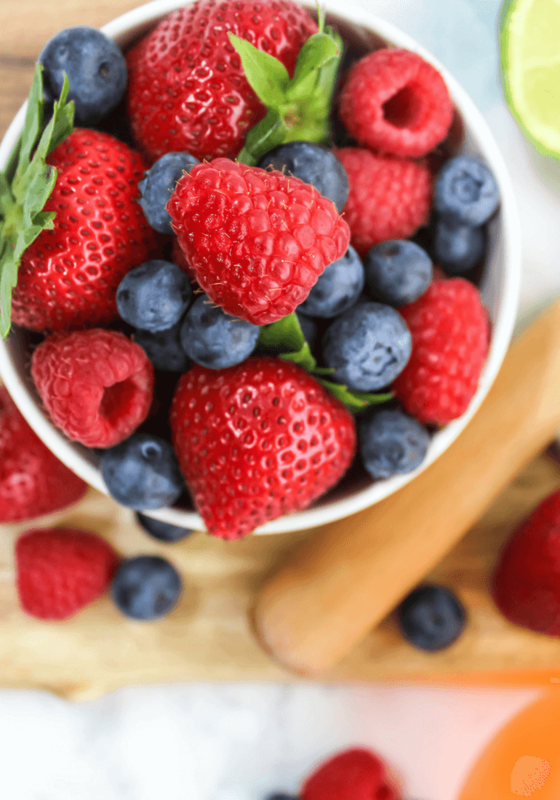 Place frozen berries into blender with the rest of the ingredients. Blend until smooth. 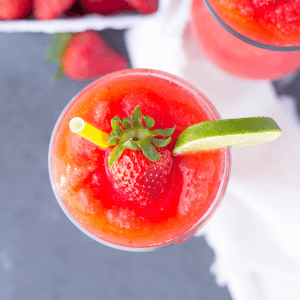 Serve in 2 glasses and garnish with a slice of lime and a strawberry. Optional to add an extra ounce of vodka to float on top of each drink before serving. Try it with a dollop of whipped cream! 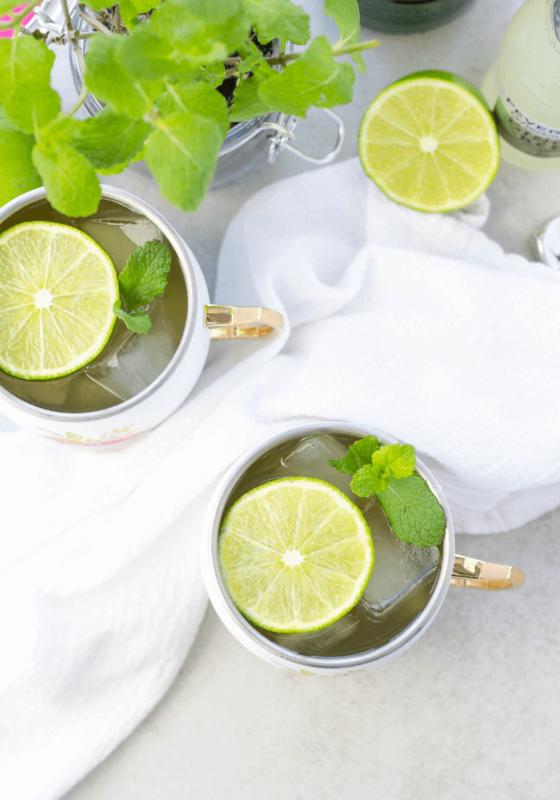 An Irish Mule is made with Jameson whiskey, freshly squeezed lime and ginger beer topped with a lime slice and a sprig of mint for garnish. Saint Patrick’s Day is just around the corner! Is there a better way to celebrate than with some Jameson Irish Whiskey? 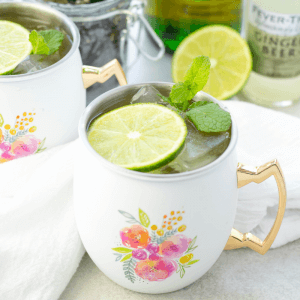 We put a little spin on a Moscow Mule which is typically made with vodka, ginger beer, lime juice, a lime wedge and mint. Swap the liquor with some Jameson and the result is ahhh-mazingly delicious and appropriate anytime of year- not just Saint Patrick’s Day! 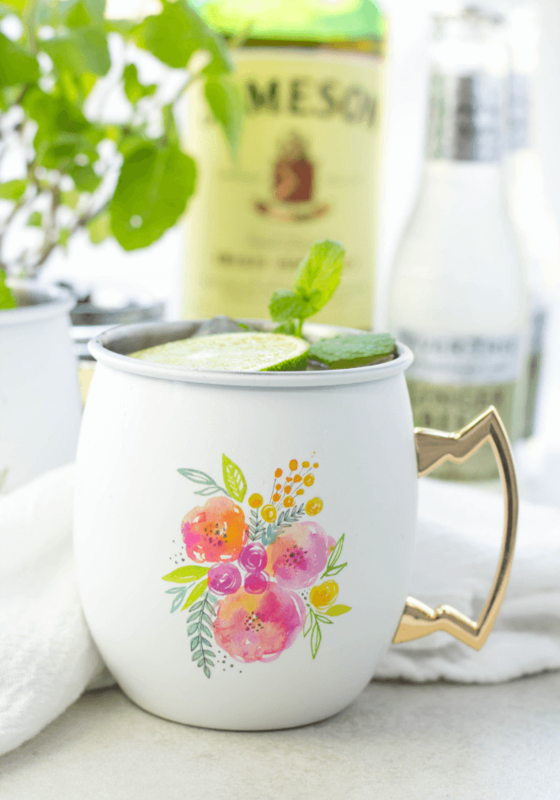 An Irish Mule is really refreshing and has great spicy kick thanks to the ginger beer. The splash of lime juice helps balance out the cocktail. The mint is optional and serves as an aromatic but looks nice and of course, smells nice too. 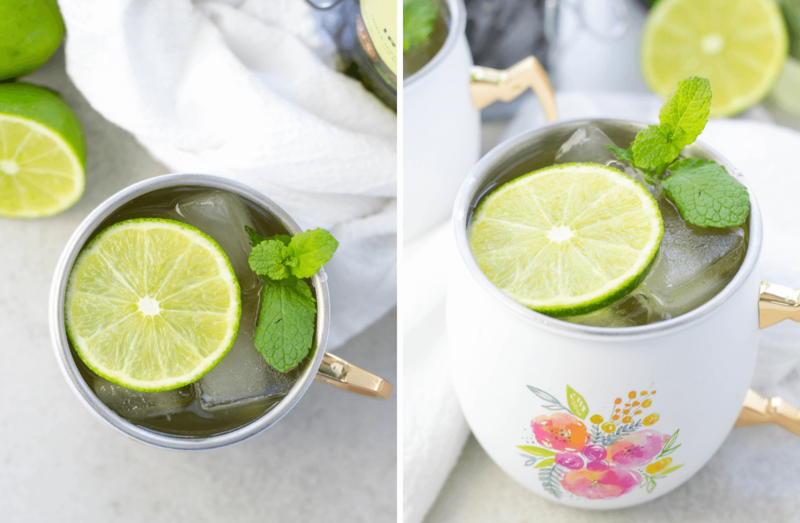 Fill a mule mug with ice. Add Jameson and lime juice. 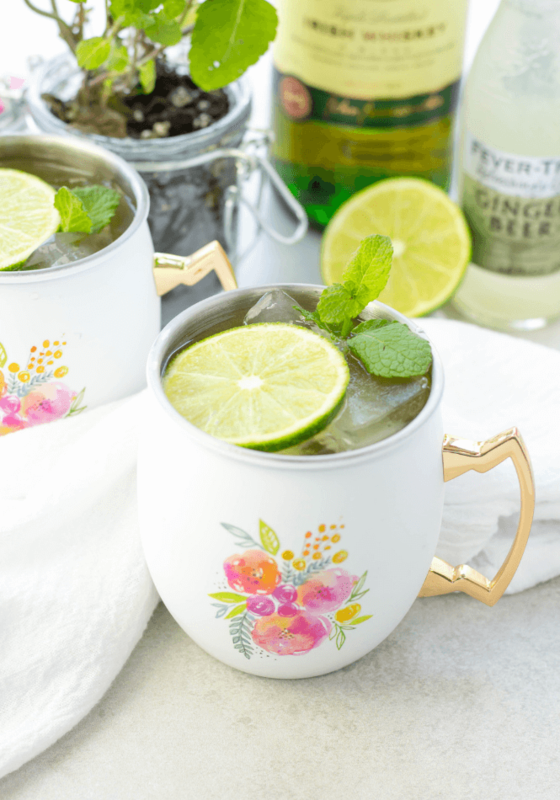 Top with ginger beer and garnish with a mint sprig and a slice of lime. 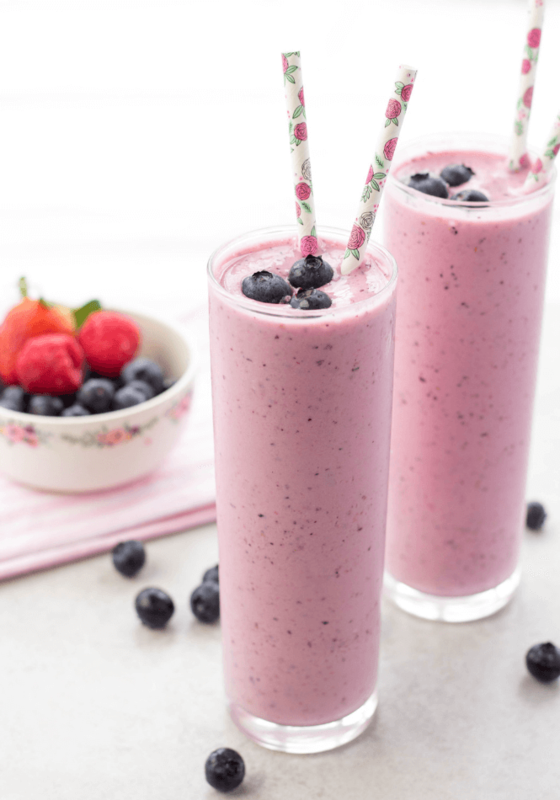 A Triple Berry Smoothie is made with strawberries, raspberries, blueberries, Greek yogurt, honey and ice for a really quick and refreshing breakfast or snack anytime. I love smoothies! Breakfast, lunch, snack… heck… sometimes, dinner- I just love them. I almost always use fresh berries for smoothies and can afford to do so because I don’t waste any food. So all those fruits and vegetables that are not eaten at the end of the week, get frozen for convenient smoothies. Either I toss everything in a little ziploc bag or if there are enough berries, I will actually portion out individual bags for smoothies. 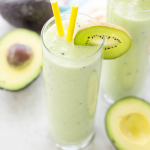 If you find yourself with any amount of waste from fruits and veggies every week, I recommend trying this out because why throw your money away when you can make a delicious, healthy smoothie out of it? Don’t have waste? First, let me know your secrets that have your family eating all the healthy stuff and second, you can still totally makes! 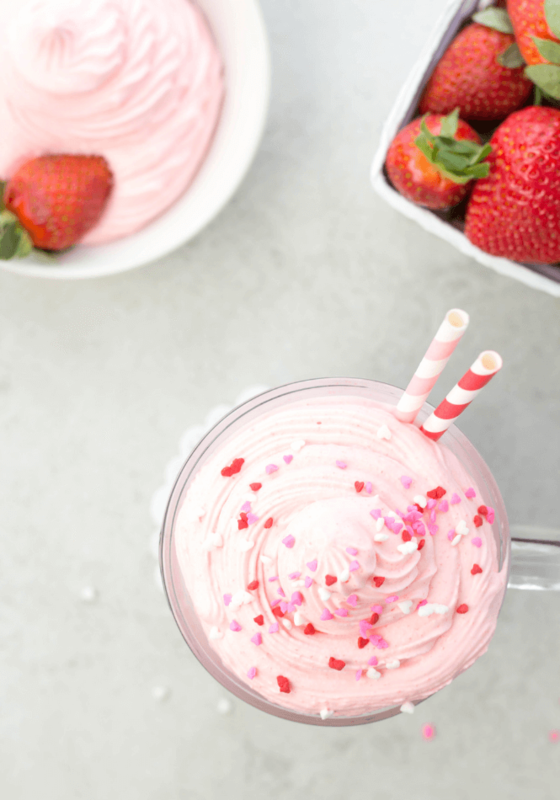 Start this Triple Berry Smoothie by washing your fruits, removing the stems slicing the strawberries in half and freezing the berries for a few hours (minimal). Add the fruit to a blender with some Greek yogurt, a pinch of sweetener and ice. Blend for 2 minutes or until smooth and drink up. You can use any sort of sweetener you like, personally I like local honey. Make it a full meal by adding a scoop of your favorite vanilla or berry flavored protein powder! Wash fruits. Remove the stems and cut strawberries in half. Measure out the fruit and place into a ziploc bag. 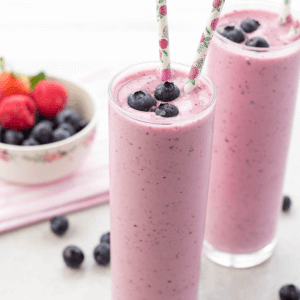 You can make multiple ready-to-blend smoothie bags at once. 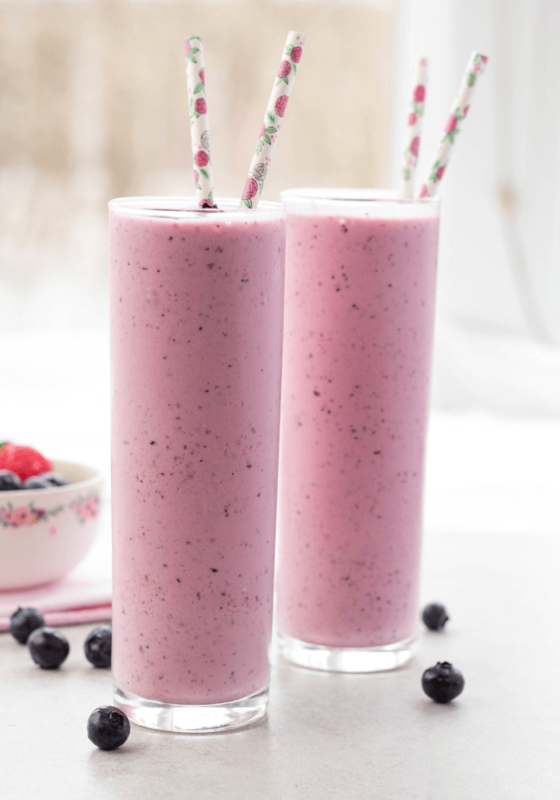 Once the berries are frozen, place into the blender with yogurt, honey and ice. Blend for 2 minutes or until smooth and all the ice has broken up. 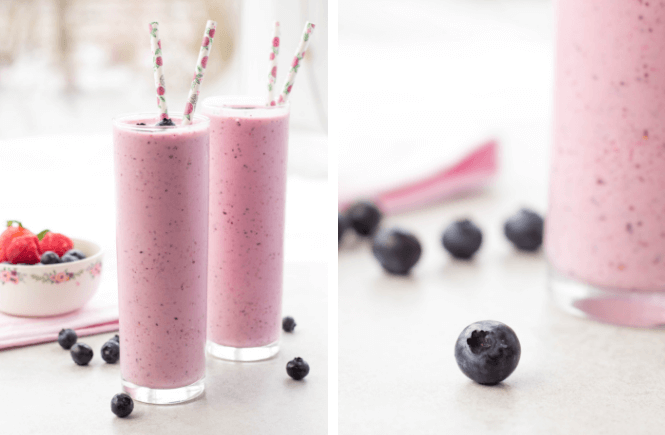 Love smoothies as much as I do? 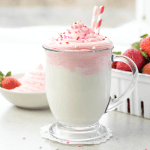 Also try this popular Strawberry Vanilla Smoothie from here at Simply Made Recipes. 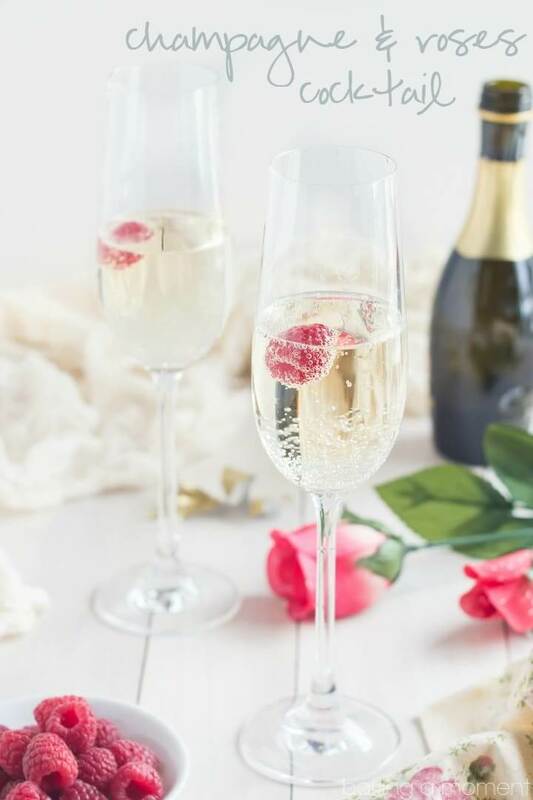 Champagne can be drunk anytime of year but New Year’s Eve and Valentine’s Day are the two days of the year it is completely necessary! 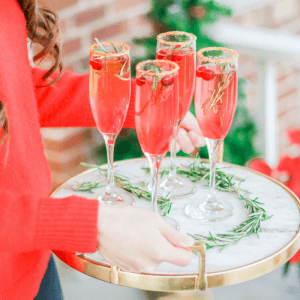 Whether you are toasting to another amazing year or celebrating a relationship (Hey, maybe you are just toasting to a Friday night), I have 12 Champagne Cocktail recipes that are simple, gorgeous and festive for the occasion! Ombré Cranberry Sparklerfrom The Diary of a Debutante is beautiful sparkling cocktail made with Prosecco, gin and a cranberry simple syrup. Garnish with cranberries and rosemary to complete this drink. Cranberry Sorbet Champagne Floats from Baking a Moment are made with a homemade cranberry sorbet for a a fun cocktail this season! Champagne Margaritas from The Kitchen is my Playground has a unique cocktail that -let’s be honest- could be for a New Year party or just to celebrate a Taco Tuesday! Either way- I am down! 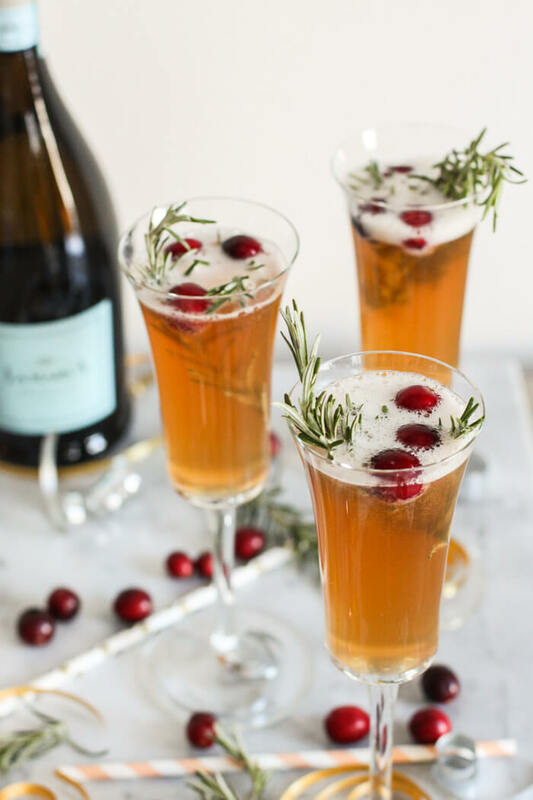 Champagne Kombucha Cocktail is a simple cocktail from The Wild Gut mixed with Prosecco and Kombucha for something bubbly to drink as the ball drops this New Years Eve. 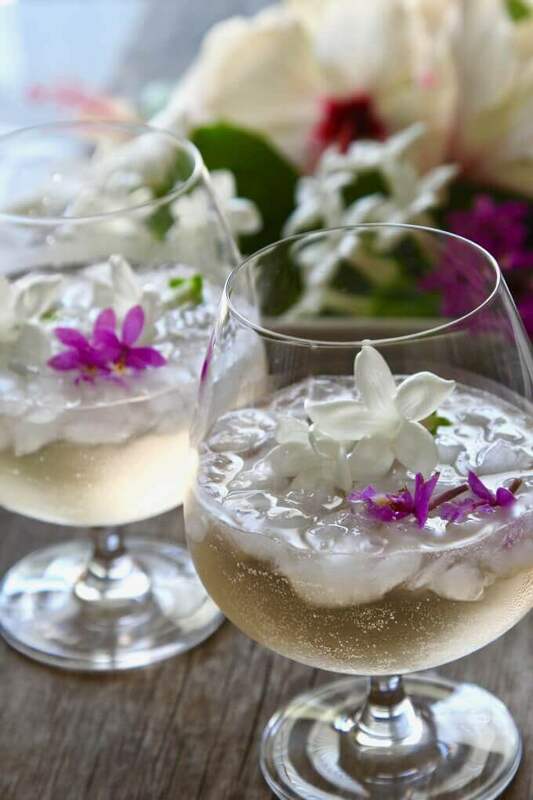 Bring the tropics into your home with this Tropical Hibiscus Spritzer from Delicious Table. A Luau with Santa? I might be on to something here…. 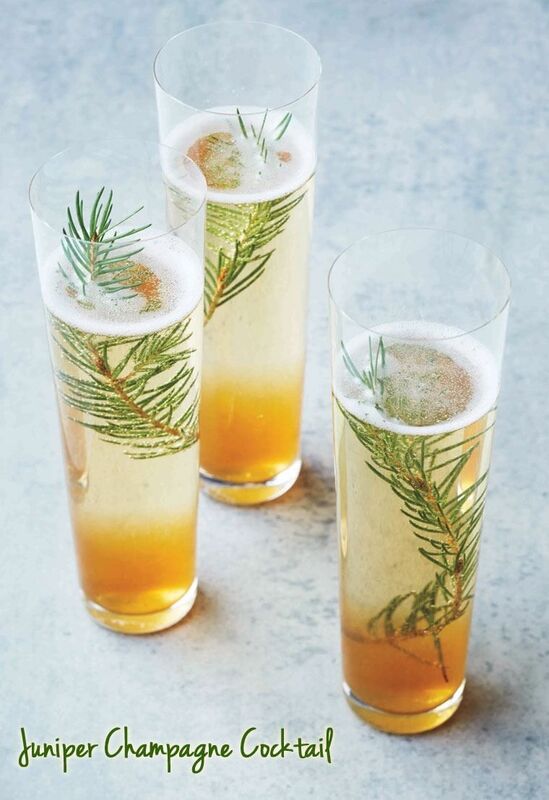 Juniper Champagne Cocktail from This Mama Cooks has juniper berries, pine sprigs and Prosecco. Let the festivities begin! Champagne and Roses Cocktail from Baking a Moment screams Valentine’s Day but I see myself even sipping this as the ball drops. 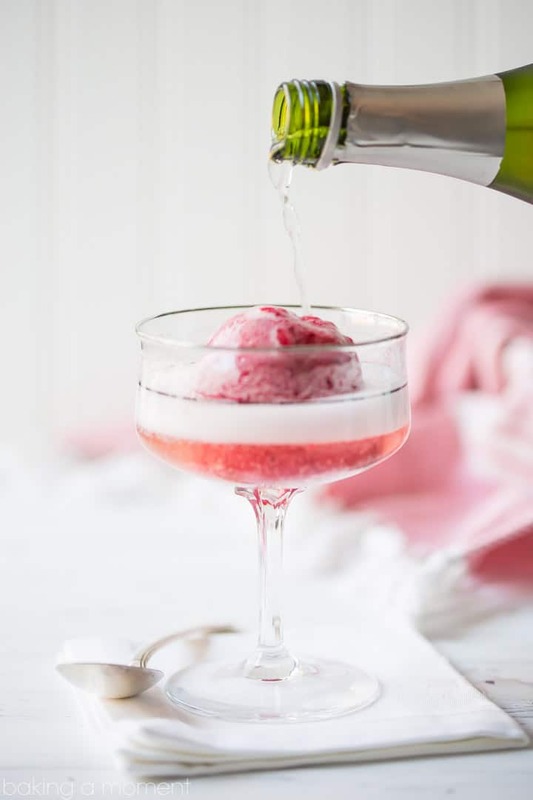 Rock Candy Champagne from here at Simply Made Recipes. 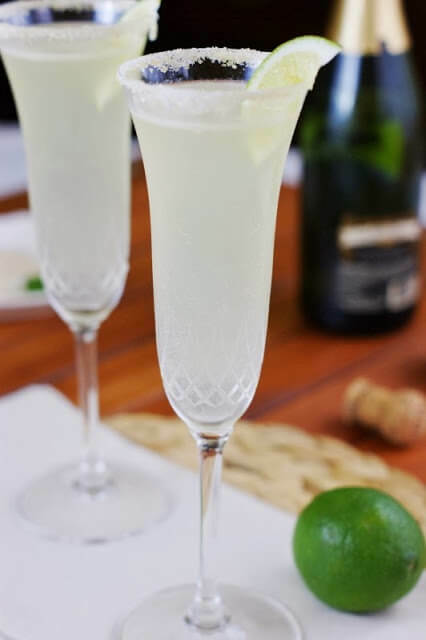 The French 75 Cocktail from This Worthey Life. Three Ingredient Strawberry Lime Champagne Cocktail from Savory Nothings. 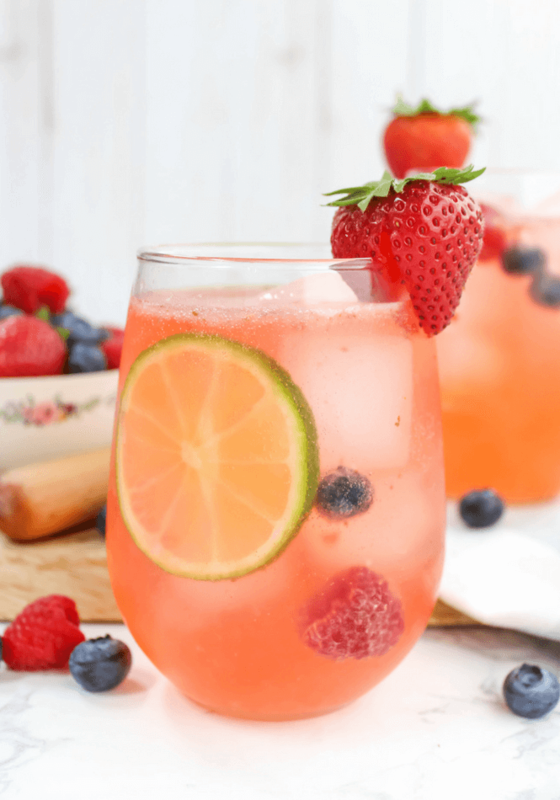 Sparkling Pomegranate Berry Punch from Serena Bakes. 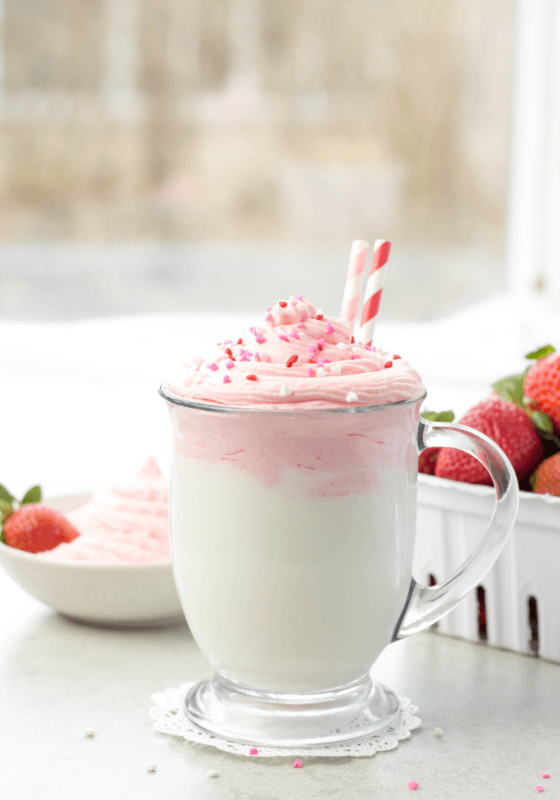 Strawberry Mimosa from Baking Beauty. 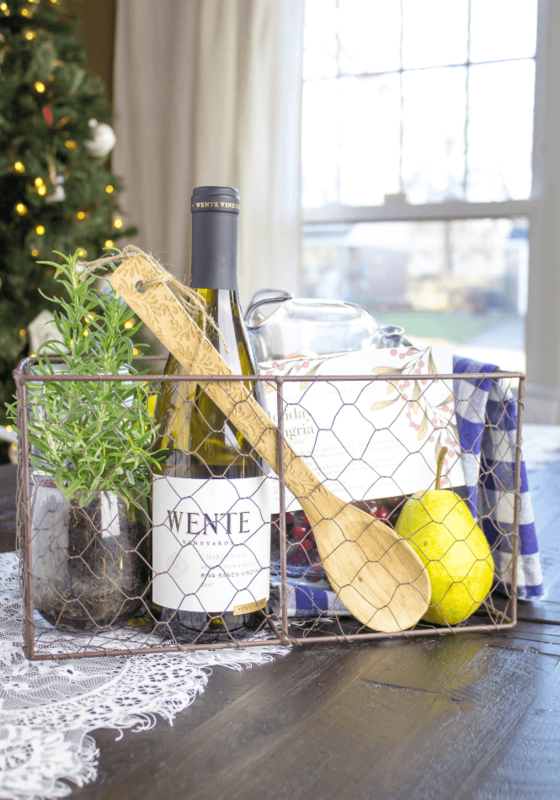 ’tis the season for gift giving, parties with friends and some good laughs over a bottle of wine. 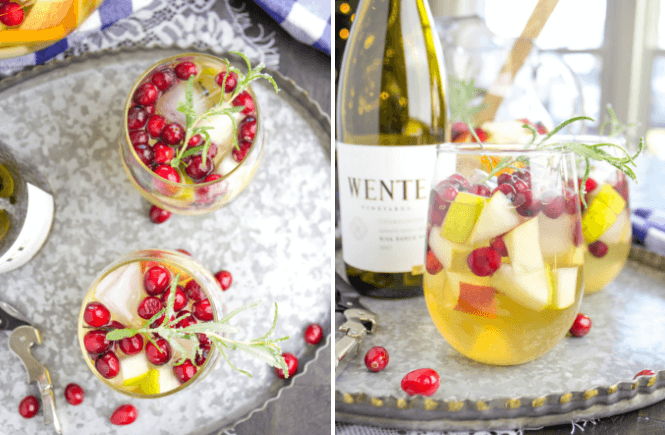 I am sharing a Holiday Sangria Gift Basket and Recipe to bring a little extra joy to your holiday season! 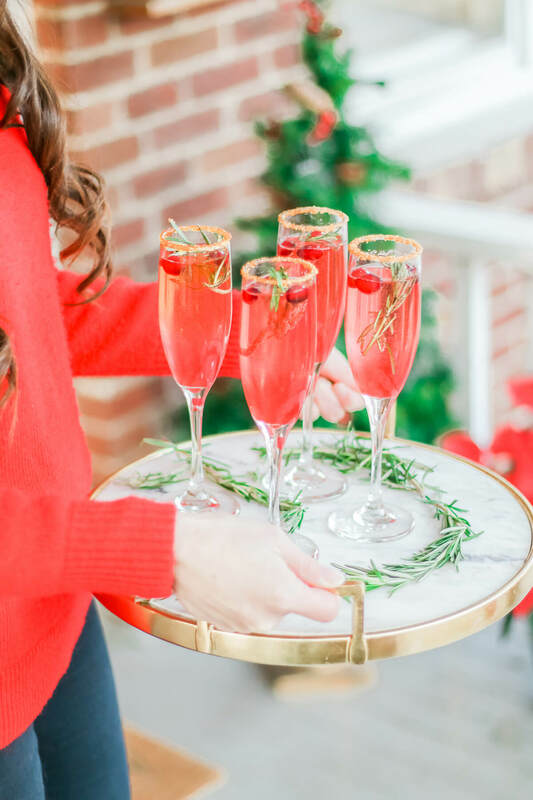 If you need a gift to bring a hostess, something creative for a gift exchange or just a great recipe to entertain friends, I have you covered! The season is full of gatherings with family, dinner parties and work functions. 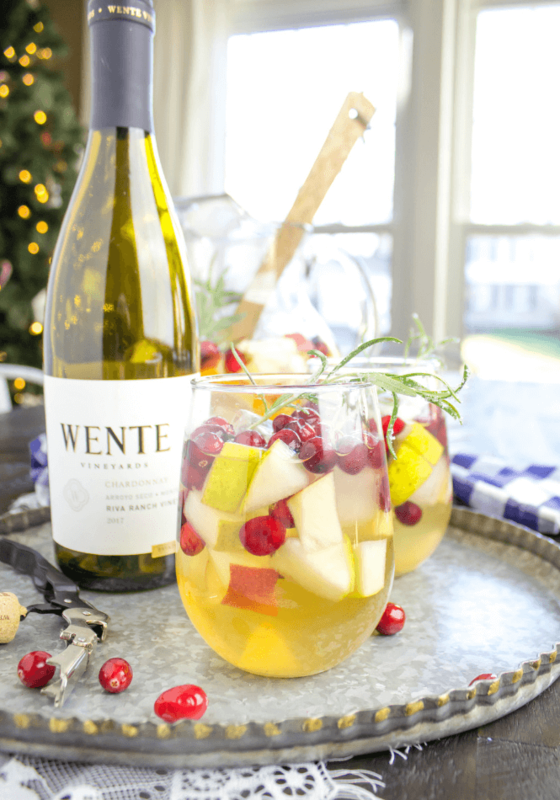 A bottle of Chardonnay is the perfect to bring or amp it up with an entire Holiday Sangria Gift Basket. 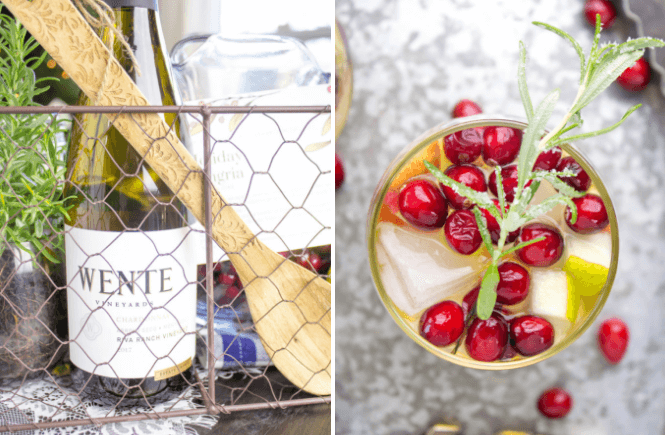 Creating a beautiful Holiday Sangria Gift Basket is a breeze! Include as many as the items from the list below within the basket so it can be used same day. 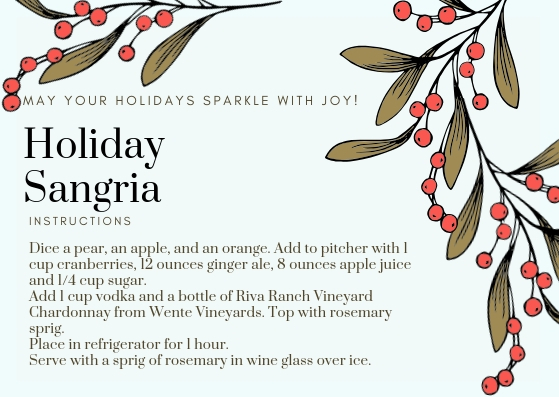 Print the recipe card below to add to your Holiday Sangria Gift Basket! 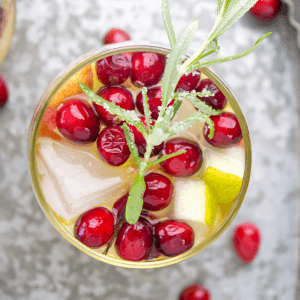 This Holiday Sangria Recipe is made with freshly diced pears and apples, sliced oranges, cranberries, juice, ginger ale and a chardonnay. 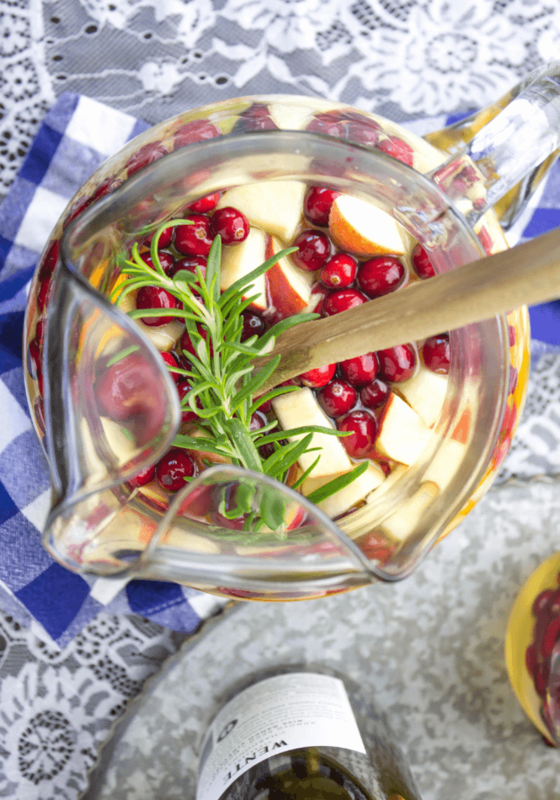 Add in some vodka for extra kick and fragrant rosemary to complete the drink. 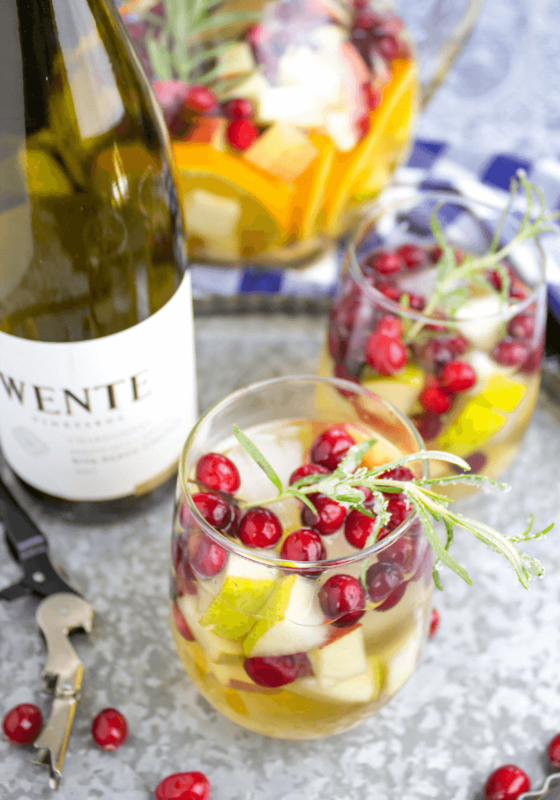 This Holiday Sangria really simple to throw together for entertaining for to enjoy with a friend on the weekend. Make sure every glass served has some of the fresh fruit from the pitcher. The fruit soaks up a lot of the alcohol and tastes great! 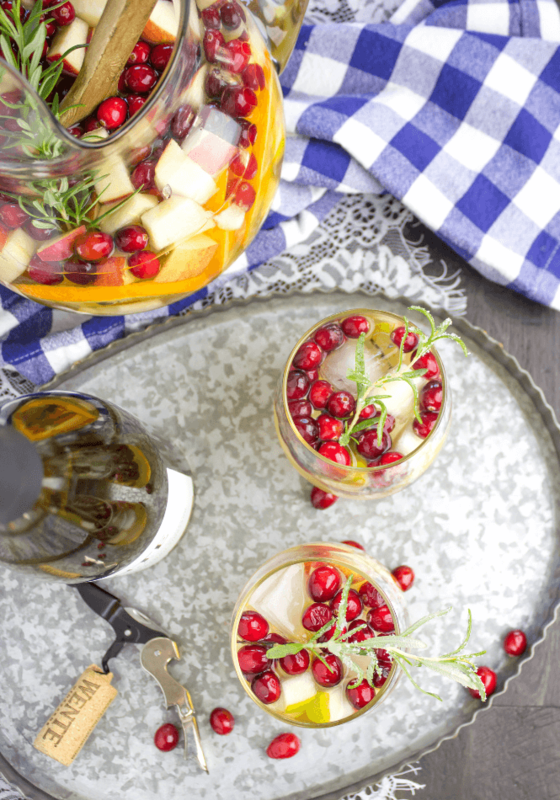 This Holiday Sangria Recipe is made with freshly diced pears and apples, sliced oranges, cranberries, juice, ginger ale and a chardonnay. Add in some vodka for extra kick and fragrant rosemary to complete the drink. Dice the pear and apple. Slice the orange. Add to pitcher along with the fresh cranberries. Pour in the ginger ale, apple juice and vodka. Add a bottle of Chardonnay and a sprig of rosemary. Let sit in fridge for one hour. What are your plans for enjoying this holiday season with friends? Let me know in the comments below. 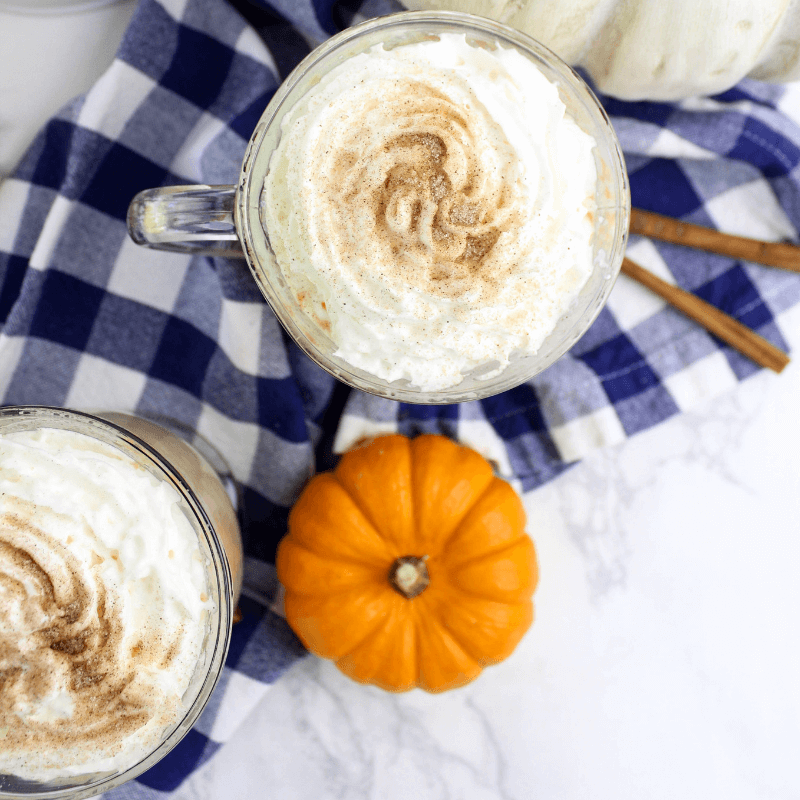 Crock-pot Pumpkin Spice Hot Chocolate is made with whole milk, pumpkin puree, pumpkin spice, maple syrup and white chocolate chips for a hot treat that is a must-make this fall season! What screams fall more than pumpkin spice? Oh that’s right- nothing! 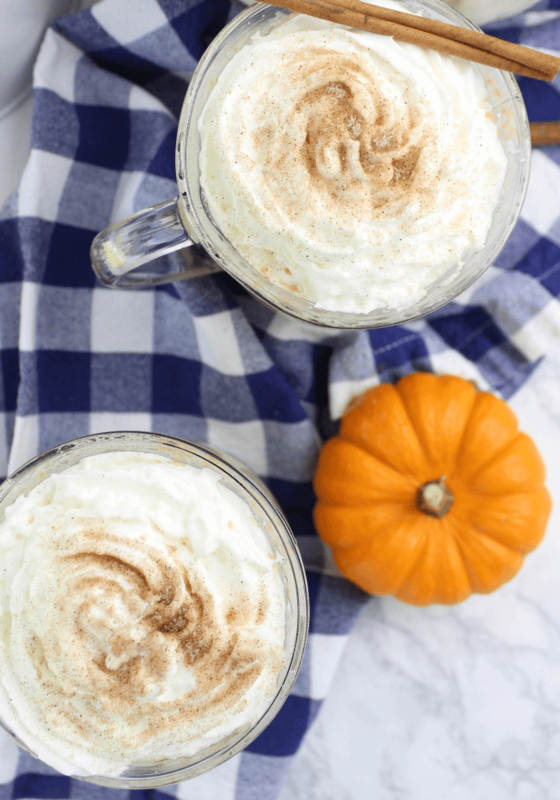 This Crock-pot Pumpkin Spice Hot Chocolate is a nice twist from a regular hot chocolate with the added pumpkin and perfect to serve for a crowd on Thanksgiving, prepare while the kids are out trick-or-treating or any other upcoming gathering this season. I am making this again for my family when we head out to the pumpkin patch in the next couple weeks as a warm treat when we get back home to sip as we carve pumpkins. I cannot wait! 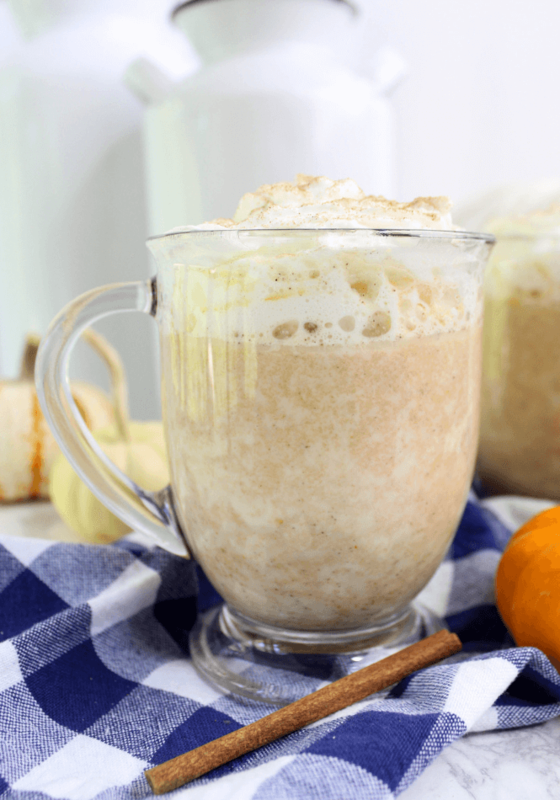 Crock-pot Pumpkin Spice Hot Chocolate is really easy to cook up in the slow cooker. You simply dump all the ingredients in, let it cook on low for 3 hours and stir as often as possible. When the chocolate has melted and the liquid is heated thoroughly, you can serve with a dollop of whipping cream and some cinnamon sugar sprinkled over top. Add a cinnamon stick for a garnish if you would like and enjoy. 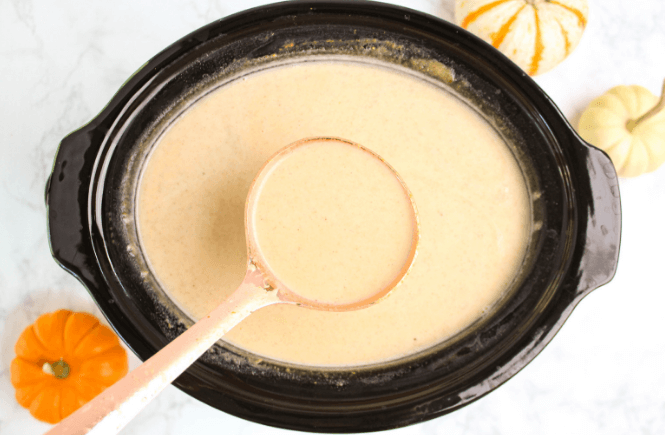 Place the whole milk, pumpkin puree, vanilla extract, pumpkin spice and chocolate chips into a 4 quart crock-pot. I actually used my 3 quart crock-pot but it was a tight squeeze so a bit larger would be ideal. Place on low for 3 hours stirring every so often. Once the chocolate chips have melted and liquid is hot, you can serve. Make the cinnamon sugar by adding sugar and cinnamon into a bowl and mixing. 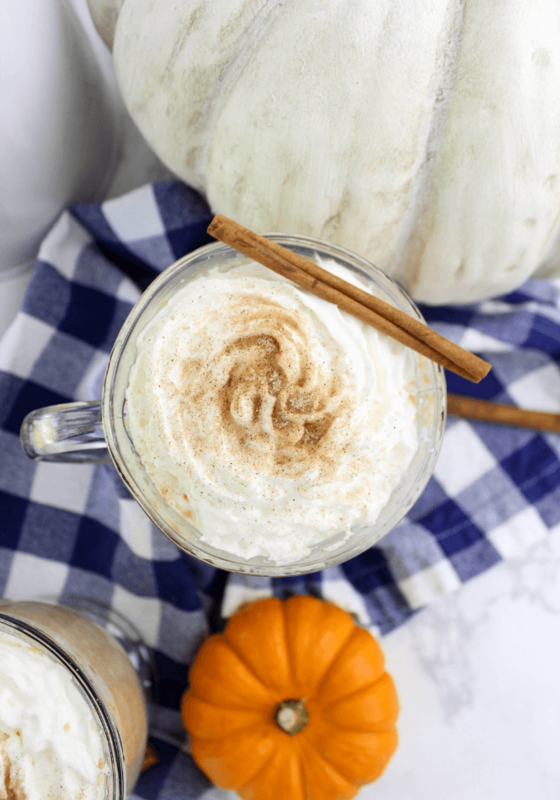 Serve the pumpkin spice hot chocolate by filling a mug 3/4 the way full, top with whipping cream, sprinkle with a bit of cinnamon sugar and garnish with a cinnamon stick. Are you a big pumpkin spice lover like myself? 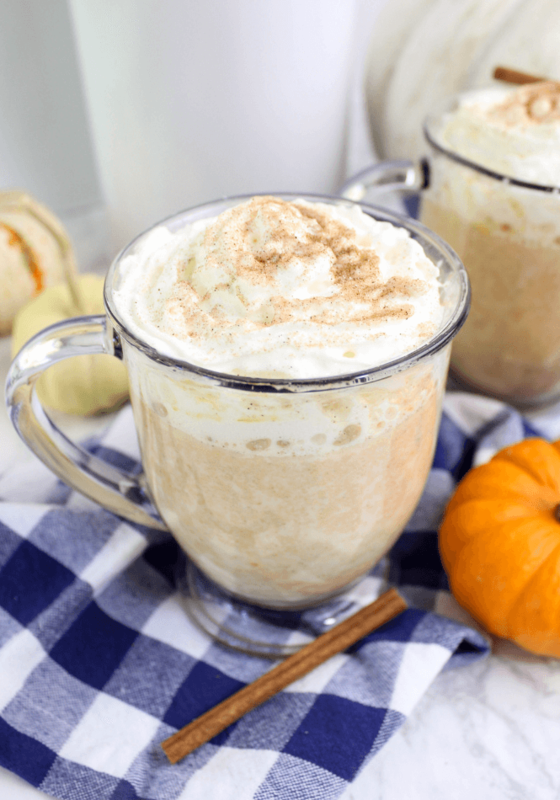 If so, you are going to fall in love with this Crock-pot Pumpkin Spice Hot Chocolate. 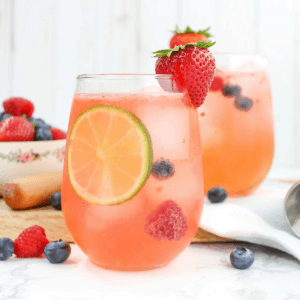 The Triple Berry Vodka Spritzer is made with fresh strawberries, blueberries and raspberries muddled with vodka and poured over ice with a lemon-lime sparkling water for a refreshing cocktail with few calories and a lot of flavor. 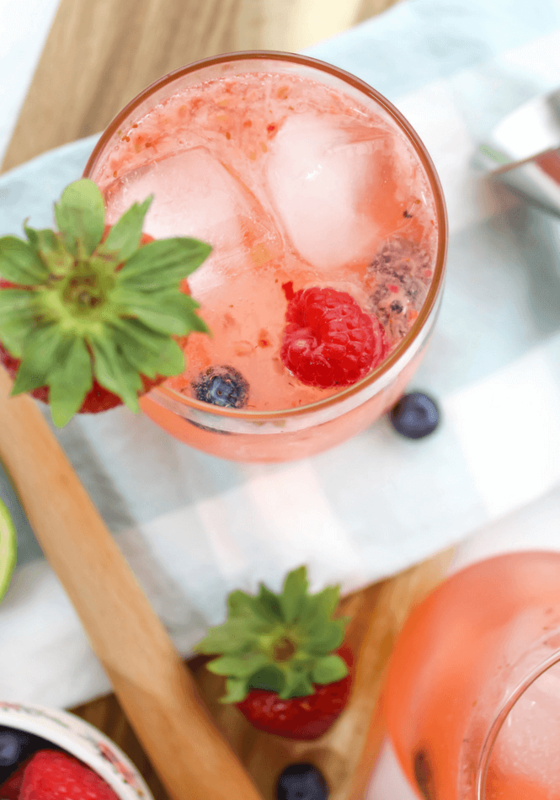 Hot summer days call for a cocktail with simplicity, low calorie and leaves you completely refreshed. 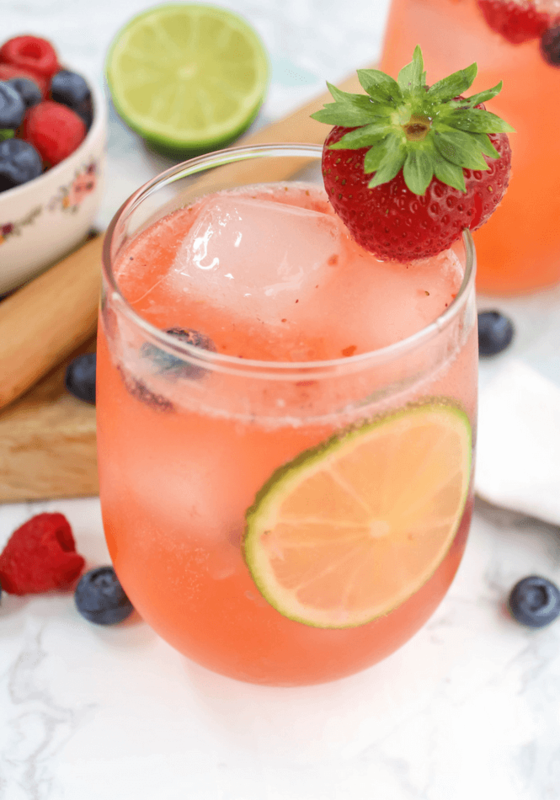 This Triple Berry Vodka Spritzer does just that! Bonus that this cocktail is also beautiful and would be great for hosting a get together with girlfriends. Muddler to squeeze the most out of the fruit for that triple berry flavor. Bar glasses. I like to use stemless wine glasses for a lot of my cocktails. In a cocktail shaker, muddle 2 blueberries, 2 raspberries and 1 sliced strawberry. Add 2 ounces vodka and 2 ounces sparkling water. Shake and strain into a glass over ice. Top off with more sparkling water. Garnish with a couple more berries, slice of lime and strawberry.